GroVia Hook and Loop Diaper Shell - EcoBaby Gear, Inc. The GroVia one-size diaper is a revolution in cloth diapering. GroVia innovative shell design minimizes diaper waste and cost. Includes one-sized shell cover. GroVia - Organic Soaker Pads (inserts/doublers) sold separately now in a 2-Pack. It is recommended to have about 6-12 shell covers, and twice as many 12-24 Organic Soaker Pads (inserts/doublers). What is the GroVia Diapering System? GroVia is a modern, one-size diapering system. Its unique, waterproof shell and organic cotton soaker pad minimize waste and cost. When the soaker pad is wet, simply replace with a fresh, dry one! How does GroVia work? GroVia is designed so that the outer shells may be used for multiple diaper changes. If the soaker pad is wet, simply snap in a fresh one and you are ready to go. If the shell is wet, allow it to air dry and use for the next diaper change. When your GroVia Shell is soiled or very saturated, start fresh with a new GroVia Shell. Most GroVia System users will find that using 2-4 GroVia Shells are enough per day, although newborn babies may need more. How does the one-size feature on my GroVia work? 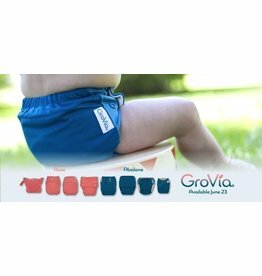 GroVia will fit MOST babies from 8-35 lbs. The GroVia Shell features three sets of rise snaps that adjust to fit your baby. Our unique one-size Organic Soaker Pad fits from 8-35 lbs as well.